What makes Kiddly Winks special? We are a family-owned, independent toy store that has been in business for 28 plus years. Our merchandise is thoughtfully selected with an educational or creative component in mind. Our 6,000 square foot stores have a huge selection of great toys, books and games, unique gifts for newborns, and our colorful, free, “talk of the town” gift wrap. We provide amazing customer service as well. We have employees with decades of experience that are here to help you pick out the perfect gift for your special kiddo! It is important when your shopping for toys to have someone to guide you in the right direction. You lose that when you walk into a big super toy store. What if you don’t really know the child you are shopping for. It is hard enough to just find an employee in one of those stores, let alone ask them to help you pick out something. Most people wander around and choose a toy not because they think it is the best choice but because they have been looking for an hour and they just want to get out of there. You don’t have a friendly face waiting to help you with your every need. At Kiddly Winks our toy experts go above and beyond to make sure you leave feeling good about your selection. Why would you want to shop anywhere else? So, Saturday is my favorite day at Kiddly Winks! It is birthday party day!!! It is a “I have 20 minutes till this party and I need something fast” kind of day. This is when our expert skills take over. We not only help you find the perfect gift, but we will wrap it in record time. Kiddly Winks is the only place you should be shopping for your children’s needs. So stop in! Shop local! Let us help you find the perfect gift to make someone’s day extra special. We are so excited about being part of Living Local	What Kiddly Winks Can Do For You! So true!! 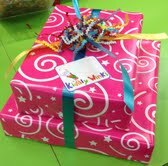 When you bring a birthday gift to a kid’s party that has been wrapped in your signature paper, the birthday child knows right away it will be a treat from Kiddly Winks. Such a life saver!! Thank you Kiddly Winks for such great toys and service. Thank you! It is such a treat to hear you like what we do! Celebrate National Art Month With Kiddly Winks! What Kiddly Winks Can Do For You!